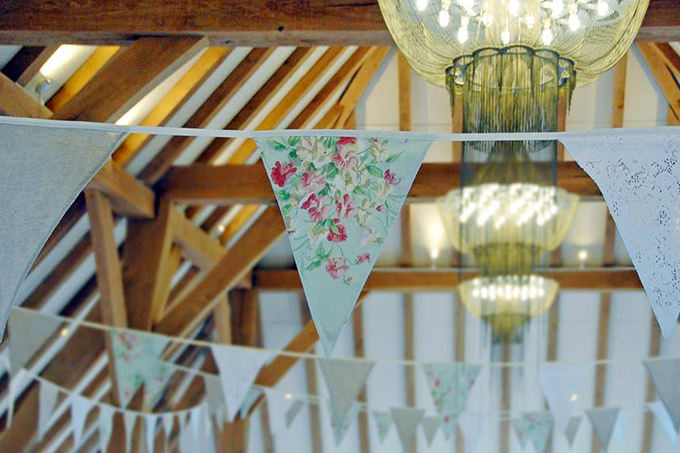 The hire fee for 60 metres of our beautiful bunting is from £150.00. The hire fee includes decorating, taking down after your wedding or event, cleaning and ironing. With new venues we initially travel to, measure up and inform you of the quantity you may require. Blue Sky Bunting flags (280mm wide x 340mm deep) are much larger than most other companies offer and when hung at height give a much more pleasing effect. At present we have 14 different styles in different colour schemes. We do add to the collection as new trends arise. Please email to discuss bespoke bunting and for a quote.